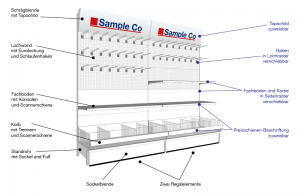 In Space Management, the assembly of a shelf is set up and documented as a planogram. All fixtures and all products, together with their concrete positions and properties, are combined in a planogram layout. In XPace, fixtures are stored in an expandable library. The product data is taken from external data sources. Shelf planning combines these elements into a planogram. 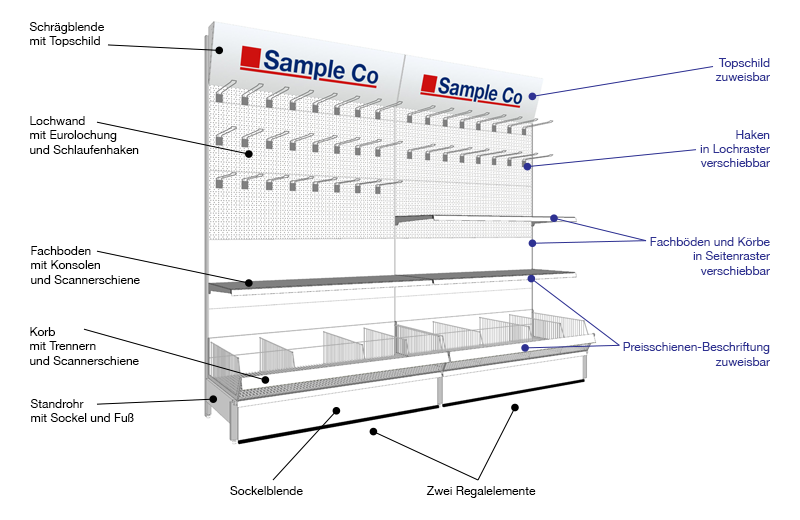 In POS planning, the planogram represents a shelf, a rack or a shop. The planogram manages all fixtures and all products together with their specific positions and properties. The planogram can be viewed graphically and in data and list form. The aim is to combine all data of a shelf planning project and thus make the shelf documentable and manageable. The shelf planning project that contains all the data of a shelf and describes the interrelationships. In the narrower sense, a planogram is a diagram that documents the target positions of products on shelves and displays and contains planned and actual sizes for the individual products. A planogram is used to analyze space and floor area use and also considers monetary data such as sales and earnings. 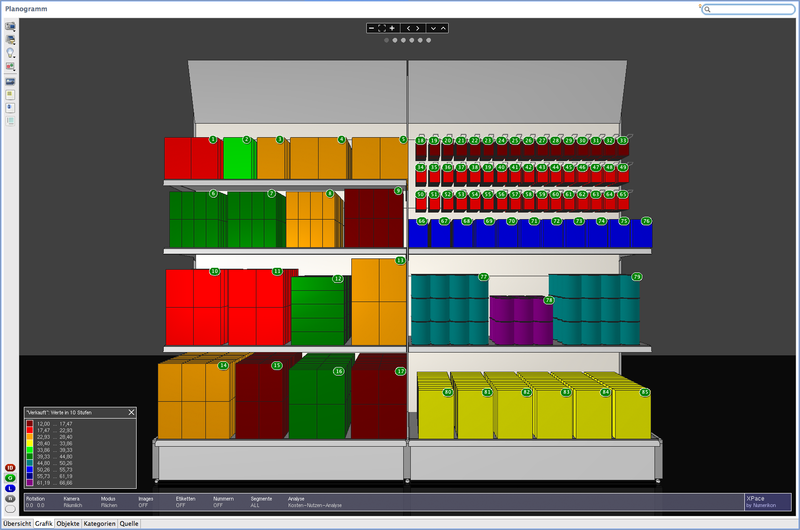 Retailers and manufacturers can use a planogram to plan, implement and continuously monitor their shelf presence to maximise space efficiency. [see Schütte; Vering: Erfolgreiche Geschäftsprozesse durch standardisierte Warenwirtschaftssysteme; Springer-Verlag Berlin Heidelberg 2004, p. 376]. By a unique project ID. A project name is also created. An extended textual description of the project can be added. The planogram can be keyworded for search purposes. A planogram is assigned to a customer and a market. An assortment is indicated. A market size class is applied. Validity period. Language and country of destination. Delivery period and customer direction. Version number. As graphics in 2D or 3D. As a list or table. As a report or export. Planograms have a status, they can be new, active, inactive, old, or have a user-defined status. Planograms can be enabled or disabled. Planograms can be stored in several versions. Historical versions of a planogram are stable, they do not update automatically when changes are made to the products, and thus enable comparisons with previous planning statuses. However, they can be reactivated and updated by the user and then represent a new version. Planograms and versions can be mutually compared. The planogram is created in the XPace planogram editor. It can also be created from historical planogram versions by updating. A planogram can be created automatically from a tabular description. It can be loaded automatically based on rules. A planogram can be imported from a foreign format. The fixture is the element that is used in space management to set up the shelves. Fixtures have a geometric shape, a parts list of their components and a behavior. The aim is to enable the construction of a virtual shelf from realistic elements and populate it with goods. The element from which racks are formed. Simple components constructively create the rack. Carrying fixtures are components that can actually “carry goods”. The products are positioned and arranged on real carrying fixtures. With a display unit object comes a parts list of its components: an XPace “shelf” contains the components “brackets”, “base plate”, “price rail” and “fixing materials” as parts list. The fixtures and components are assembled into a (initially empty) rack. Rules, grids and anchor points ensure the correct interaction between different fixels: For example, a shelf moves with its brackets in the grid of the side columns. A carrying fixture has attributes that determine how and where products can be positioned. The positioning space for products limits the goods occupancy of the fixel and ensures the correct behaviour. A purely constructive component stands alone and can only contain other components. 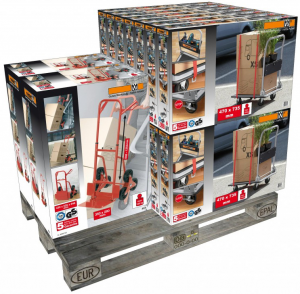 A real carrying fixture also describes where and how the products are to be positioned and arranged. A distinction is made between hanging, standing stacked and loosely piled product positioning. A limitation of the fill level. A forced product rotation. Limits on the size of the product blocks. Grid points and anchor arrays. Behavior in case of gaps. Required grip spaces next to the products. The interaction of several positioning spaces on a fixel. For each product support, a description of its three-dimensional geometry is stored. This determines both the dimensions and the appearance in the planogram graphic. The XPace standard library contains all relevant fixtures for the construction of wall shelving, centre space gondolas, pallets and lattice boxes as well as heavy duty shelving. These parts already cover the most common applications. Special components, displays, holders and presentation systems can be created with the XPace Mockup module and integrated into the component library. The product is the central data element in space management. Product data determines how, where and why positioning is performed on the shelf. The aim is to be able to insert products with their dimensions and data into a planogram and manage them at their position. The central element of desire on the shelf. The product is a source of revenue and profit. The products should adequately represent their product group on limited shelf space and meet customer expectations. To do this, they compete for available shelf space. The primary key is the article number (stock keeping unit, SKU). Variants of an article can be distinguished by a Variant ID. The EAN/UPC/GTIN also identifies a product, but is often not unique enough. Further IDs can be added within the framework of merchandise management. For shelf planning, at least the article number, a descriptive text and the width, height and depth in terms of packaging dimensions are required. Classifying assignments such as merchandise category, assortment, brand, product family. Prices and conditions. Additional texts, also in foreign languages. Customized price lists. Logistical data such as hangability, pourability, position of the hook hole, nesting. Target specifications for quantities and packaging units. Components in the sense of a bill of materials. Rules and restrictions for positioning on specific fixtures. In the simplest case as white or colored box. When digital images are available for the products, the images can show the product photorealistically from one or all sides. 3D models can create geometries that differ from the simple box, which allows the product to be displayed completely realistically on the shelf or on the pallet. Enable positioning types: in XPace, a product can be positioned as hanging, standing stacked or loosely piled, the permitted types are defined per article. Prospective articles are products that do not yet exist in the company’s active product range, that is, they have not yet been created in merchandise management, but should already be used for shelf planning. These articles can be managed separately. Foreign goods and dummy articles can be managed in a separate XPace channel. Articles can have a status, for example, they are new or expiring. The status can be taken into account in queries. Product data is usually taken from other data sources that are maintained in other systems. Sources can be a merchandise management system, an ERP system, a PIM or PDM system, any database or Excel. Data access works via one of the supported interface technologies. The data transfer is controlled by an import script. Product data and product forms of alternative, new or prospective articles can be created and designed directly in XPace. They are managed in a separate channel. Virtual shelf planning generates a planogram that manages the data of all fixtures and products in a virtual project. XPace contains all functions, algorithms, data structures and interfaces for qualified planogramming.